Australia has acquired a reputation for rapidly changing prime ministers: five times in the past nine years. Yet it could soon have another if Bill Shorten's Labor Party wins an election on 18 May. Mr Shorten, 51, is hoping his centre-left party can unseat Prime Minister Scott Morrison's conservative government. 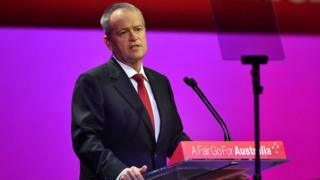 Widely viewed as an archetypal Labor politician, Mr Shorten was a key player in brutal party coups that unseated prime ministers Kevin Rudd in 2010 and Julia Gillard in 2013. However, he's since been credited with uniting Labor after that tumultuous period. He will contest this election in his sixth year as opposition leader. Born in Melbourne, Mr Shorten forged his early career in trade unions. Rising quickly, he became head of the powerful Australian Workers' Union in 2001. He was thrust onto the national stage in 2006 after a mine collapse in Beaconsfield, Tasmania, that killed one miner and trapped two others for two weeks. The story gripped Australia, and Mr Shorten - though accused by some of opportunism - became a prominent advocate for the trapped men and workplace safety. He told reporters at the time: "It was these hard-rock miners, and their union, who never gave up on the two men trapped under 925 metres of earth and rock." Entering parliament in 2007, Mr Shorten was immediately spoken about as a future leader. He came up through Labor's right faction, meaning he "hopes to civilise capitalism rather than overthrow it", says Prof Rodney Smith from the University of Sydney. Mr Shorten is married to Chloe Shorten, the daughter of Quentin Bryce, who was Australia's first female governor-general - the Queen's representative in Australia. Mr Shorten served as a minister under both Mr Rudd and Ms Gillard, building a reputation as an internal powerbroker but also as a competent, disciplined politician. In Mr Rudd's government, Mr Shorten campaigned for the National Disability Insurance Scheme - a landmark reform later implemented under Ms Gillard. After she seized power, Mr Shorten was promoted to cabinet and oversaw portfolios including financial services and workplace relations. He later became education minister when Mr Rudd was reinstalled as leader. Since becoming opposition leader in 2013, Mr Shorten has made party unity and internal consultation priorities, observers say. Mr Shorten has sought to build a narrative that Labor will better reward lower-paid workers and reduce tax loopholes for the "big end of town". 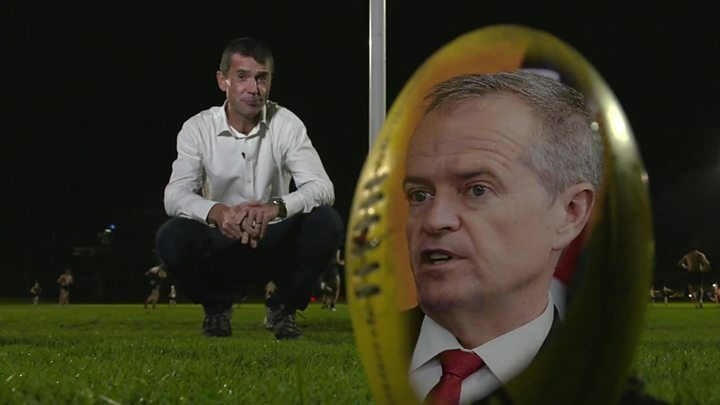 Media captionAustralia election 2019: What's up for grabs? He also wants to raise Australia's foreign aid to 0.5% of gross national income (up from 0.22% currently), and ensure half of Australia's energy comes from renewable sources by 2050. Mr Shorten has not indicated that he would change Australia's controversial asylum seeker policies. Currently, asylum seekers who travel to Australia by boat are either turned back or detained overseas. Dr Rebecca Huntley, a social researcher specialising in Labor policy, says Mr Shorten has "hung his political capital" on a suite of "affordable housing policies", in a bid to capitalise on his rhetoric of building a "fair Australia". Mr Shorten has won praise for his ease in town hall-style settings, but he sometimes draws attention for his more stilted one-liners - often to the delight of political satirists. Recent opinion polls have consistently put Labor ahead of the government, but those measures also suggest that Mr Shorten is behind Mr Morrison as preferred prime minister. Prof Smith says "that likeability perception" could remain an issue, even if Mr Shorten gains power. Dr Huntley has done voter research which backs this up: "People still view him as one of the 'faceless men' during Labor's time of turmoil, who happily switched allegiance from one leader to the other to preserve power." What type of leader could he be? "I think Shorten would focus on classic Labor policies: health, education, social policy," Prof Smith adds. "Coming into a strong budget, he can afford to be somewhat expansionary. They've set out a strong agenda. His conservative opponents, though, will say he's beholden to the unions and higher taxing, higher spending." Dr Huntley says environmental policies are Labor's strength: "Meanwhile, the Liberal party are seen by voters as incapable of getting beyond whether climate change is real." "This really is Bill Shorten's election to lose," says Dr Huntley.